The fourth annual gala dinner for the SA Guide Dog Association began with the patter of paws as all the working dogs and puppies of the Association made their entrance! Held at the Century City Conference Centre on World Sight Day, the guests were also introduced to two beautiful Labrador puppies sponsored by the 476 Charitable Trust. Moreover, the Association was able to raise the R500,000.00 needed to train five guide dogs for the Cape Town region. The Events Draping Co. team was at Century City to set up draping for the special evening. 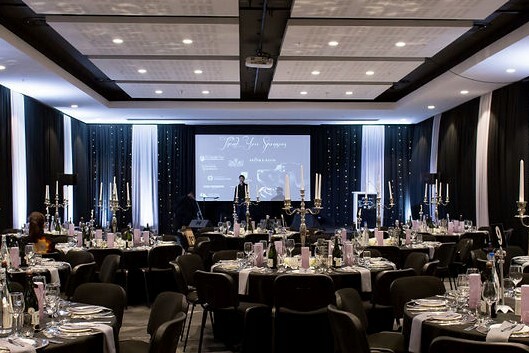 Black fabric with sliver grey accents was draped behind the stage and on the sides of the events venue. Fairy lights in the backdrop created a classy look for an evening that was as much fun as it was a worthy cause!